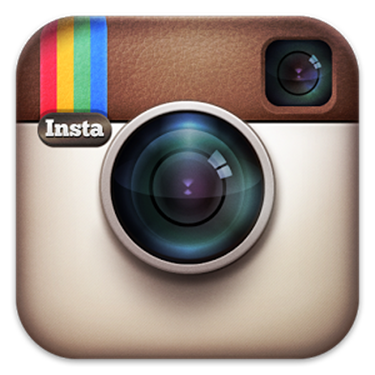 Dr. Steinbrech specializing in male plastic surgery for bodybuilders in Los Angeles, CA. Men in LA are all about health, wellness, and fitness. Industries are dedicated, and livings are made based off the mass appeal of a body builder’s aesthetic. Dr. Steinbrech provides expert services to help competitive bodybuilders, and other influencers achieve their optimal, desired look, when rigorous workouts, and extreme clean dieting have hit a plateau. You are seeking the look of a professional, competitive bodybuilder. Gynecomastia is the condition of enlarged male breast tissue, commonly treated with male breast reduction surgery. Gynecomastia is a condition far more prevalent than many realize, as it affects an estimated 40 to 60 percent of the male population. Oversized breasts in men can cause embarrassment, emotional distress, low self-esteem, as well as avoidance of intimacy. Gotham Plastic Surgeon, Dr. Steinbrech, has extensive experience in male breast reduction surgery, giving thousands of men the self-esteem they desperately seek. No longer do Dr. Steinbrech’s patients have to hide under lose clothing or feel embarrassed by their once-problem area. Male breast reduction surgery can be achieved by liposuction and/or by removing excess glandular tissue. The surgical time is on average two hours and requires local or general anesthesia. You will be required to wear a special compression garment for a period of time during recovery to help support the new contours of your chest. Downtime is minimal (roughly one week) and results are permanent, unless future access weight gain causes excess fat in the breast area. 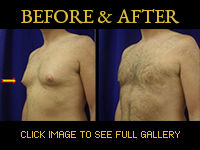 When considering male breast reduction surgery it is important to look to a board certified plastic surgeon. 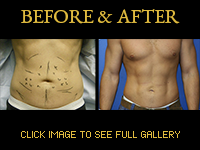 Cost of surgery is worth the comfort and trust you will obtain with the right surgeon for you. Pectoral implants began as a way to enhance the figure of body builders who could not develop their chest muscles with regular exercise-yet wanted a muscular and full look. Many men are unable to achieve the chest development they desire on their own. Pectoral implants are the solution for thousands of men seeking to look their best. Hi Def Pec Enhancement by Dr. Steinbrech offers sculpted and fuller looking contour to the male chest-offering overall balance to the muscular body of a body builder. Hi Def Pec Enhancement differs from a regular pectoral implant surgery as Dr. Steinbrech artfully gives a chiseled full look to complete the shape of the finest body builders. Post Hi Def Pec Enhancement patients can expect soreness for a few days post surgery. Full activity (such as strenuous exercise) is restricted for up to six weeks, however normal activity can be resumed after as little time as 1 week. Dr Steinbrech is a plastic and reconstructive surgeon that specializes in liposuction. Liposuction sculpts the body by removing undesirable fat that has not responded to diet and exercise. How does Hi Def Liposculpting differ? Hi Def Liposculpting by Dr. Steinbrech offers a more targeted and defined result. When used on the upper and lower abdomen, Hi Def Liposculpting chisels out the perfect six-pack and pelvic lines for the ultimate Body Builder phsyique. To setup up you no-obligation bodybuilder male plastic surgery consultation in Los Angeles, please fill out the contact form to get started.